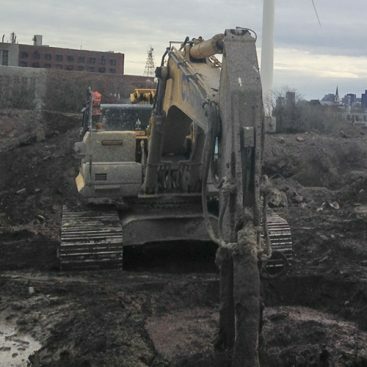 EPRI and multiple interested parties have been pursuing an opportunity to apply ISS of MGP impacted sediments for several years leading up to the field demonstration. Several sites were evaluated and pursued from a regulatory standpoint and logistically for launch sites and test areas. 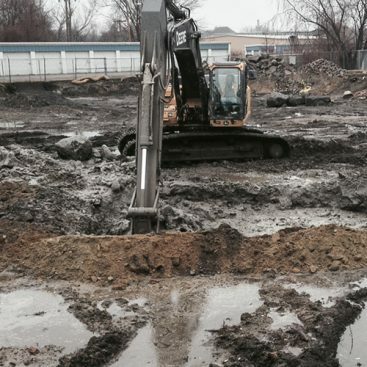 In addition, Geo-Solutions performed ISS treatability programs for multiple sites during the process. Solidify MGP NAPL-containing sediments under several operational conditions and generate sufficient performance data to evaluate the application of the technology under typical conditions. Minimize environmental disruption to surface sediments and river water quality. Minimize elevation increase in the sediment surface due to expansion caused by mixing and delivery of reagents in the solidified columns. Document special health and safety considerations, additional costs and logistical and permitting challenges associated with on-water operation of ISS equipment. 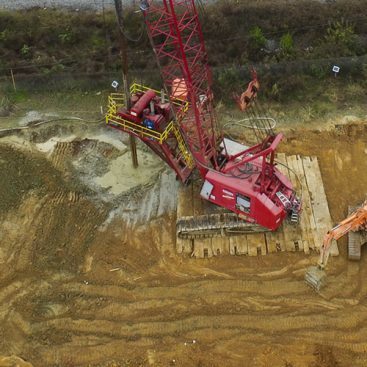 For this technology demonstration project Geo-Solutions set up ISS equipment on Flexi-Float Barge system which included: a batch plant (cement silo, pumps, high shear mixer) and an 180,000 lb hydraulic drill rig. 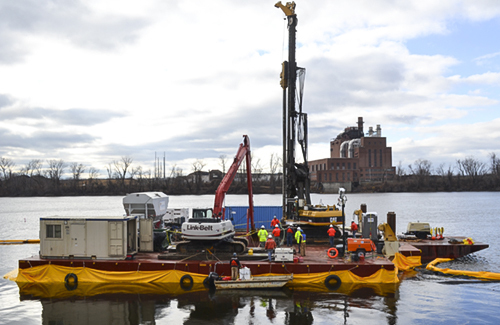 The barge was then relocated to drilling site 5 miles downriver to perform the pilot test study. 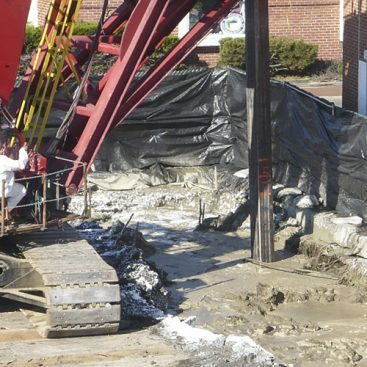 Thirteen (13) ISS columns were installed to varying depths of 8-17 feet below sediment surface. Operational parameters including RPM, penetration, grout flows and mixing passes as well as mix designs and reagent additives were varied. Quality Control monitoring was performed including: pH and Turbidity measurements at the monitoring points, Visual inspections for sheen and turbidity within working pool, inner and outer silt curtain, swell measurements, and ISS rig monitoring consisting of grout flow, depth, rotations per minute (RPM), strokes, rotary head pressure. Parameters at the Monitoring Point did not exceed background conditions measured at the Reference Point. Sheen observed was confined within the established limits of the dual turbidity curtains/absorbent booms. Swell was recorded at approximately 0.5-1.0 feet based on preliminary soundings. Penetration and withdrawal speeds were slowed to further limit turbidity and disruption of the top sediment which seemingly lowered the turbidity levels. This project was completed safely, on schedule and on budget. The project succeeded in the proof of concept and offers a viable option for further pilot testing or full scale application in appropriate conditions.